I borrowed stole this book from one of our hosts – it was in his car, and I realized that it’s been on my list of books that I knew I’d love, so I casually asked about it. Turns out someone else had given it to him, telling him he’d love it, but he was never going to get around to reading it. So I claimed it as mine! All mine! Nothing delights me more than reading about economists and physicists who are attempting to Explain It All (like Clarissa, who probably grew up to be an economist or physicists, don’t you think?) – I love that it never occurs to them that, perhaps, this is a bit of a lofty goal. They’re just following the information, like a hound dog on the scent, and throwing together theories as fast as they can. Perhaps I can relate to this mix of childlike curiosity and blind optimism (or hubris) – there are moments when I wish I could be doing what they’re doing. Instead, I’ll continue applying myself to planning epic parties and offering unsolicited life-coaching to all my friends. ← It was an epic Saturday. have you read any Malcolm Gladwell? I get his books mixed up with this one. They’re very similar–looking at random stories through a sciencey lens. 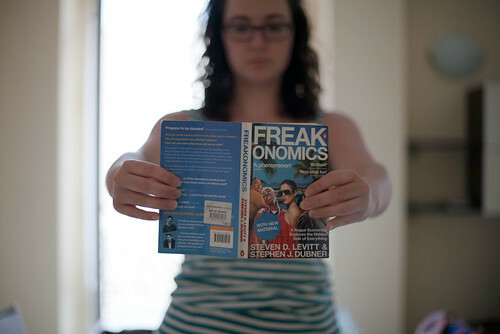 Also, I just learned last week that there is a follow-up to this one called Super Freakanomics! Julie – I also love Malcolm Gladwell, and this book definitely reminded me of him. I loved this and own the 2nd one but haven’t read it yet.